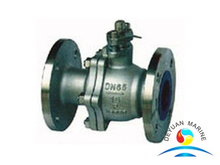 Ball valve is a quarter-turn valve which uses a hollow,perforated and pivoting ball to control flow through it. is stainless steel, brass,bronze,Chrome etc. Our marine ball valve has approved by CCS,LR,BV,RINA etc,feel free to contact us for more details if you are interested.